The arsenic concentration in the well water during the pilot test ranged between 2.3 and 4.5 micrograms per liter (μg/l), which is below the maximum of 10 μg/l allowed by the EPA’s Arsenic Rule and DPH regulations. 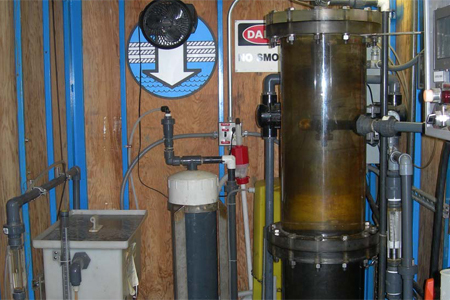 The manganese concentration in the well water during the pilot test ranged between 86 and 207 μg/l, and the iron concentration ranged between 630 and 3,300 μg/l. The project specifications require that the finished water from the proposed treatment system shall satisfy the EPA and California Department of Public Health (DPH) regulations and standards, with a raw water arsenic concentration of up to 15 micrograms per liter (μg/l), a manganese concentration of 56 μg/l, and a pH of 7.9. The DPH Secondary Standards limit the concentration of manganese in the filtered water to 50 μg/l, and limit the concentration of iron to 300 μg/l. The pilot study was conducted in four runs. The results of the first run were significantly affected by the high levels of iron in the raw water, which was not anticipated as the project specifications did not indicate the presence of iron. Influent iron was much lower during the second, third and fourth runs, and the test results from these runs were all similar in terms of filter headloss and the removal or reduction of iron, manganese, and arsenic.